HomeCurrent debatesWho will stop the AfD? “Political Earthquake”, “Election Shock” or “Swing to the Right” ran the headlines on the day after the state elections in Baden Württemberg, Saxony Anhalt and Rhineland Palatinate. That the racist Alternative für Deutschland (Alternative for Germany, AfD) would be the big winner was already clear before the elections. But the fact that they performed so strongly was, nevertheless, an unpleasant surprise. With more than 24 percent the AfD jumped from nothing to become the second-strongest political force in Saxony Anhalt in the East. Its results of 15.1 percent in Baden Württemberg and 12.6 percent in Rhineland Palatinate show that with its racist rabble-rousing it was also able to gain a foothold in the west of Germany. The AfD had posed the three state elections as a kind of referendum against federal chancellor Angela Merkel and her refugee policy, using the slogan “Merkel Must Go”. Here the conservative Christian Social Union in Bavaria (CSU) under Horst Seehofer provided the AfD with covering fire, despite the CSU’s alignment with Merkel’s Christian Democratic Union (CDU). 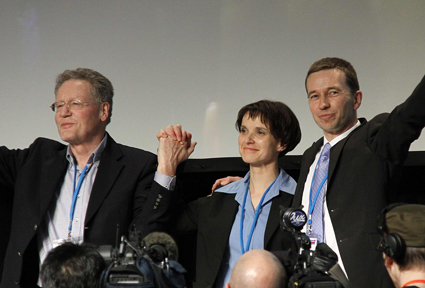 In this undeclared referendum the CDU’s top candidates Reiner Haseloff (Saxony Anhalt), Julia Klöckner (Rhineland Palatinate) and Guido Wolf (Baden Württemberg) supported the anti-Merkel position and in the two latter western states they lost clearly to Merkel supporters Winfried Kretschmann (Greens) in Baden Württemberg and Malu Dreyer (Social Democrats, SPD) in Rhineland Palatinate. In Saxony Anhalt by contrast the anti-Merkel candidate Haseloff suffered only slight losses to the AfD. In the western states at least Merkel can in this respect see her position as having been strengthened against Seehofer, even if in the process the CDU was severely weakened. Klöckner, Wolf and Haseloff tried to reduce their losses to the AfD with a right wing critique of Merkel’s refugee policy. They failed because, as could be expected, the opponents of the refugees decided to choose the original and voted for the AfD. Now Seehofer is threatening to split the CSU from the CDU. But his course is suicidal. The racist spirits he is conjuring up won’t benefit a rightward facing CDU/CSU; instead they will likely move even further to the right. The election victories of the Greens and the SPD in the Western states show, however, that there is still an anti-racist mood. Nevertheless, Die Linke (the Left Party) is among the losers in these elections. The party failed to get into parliament in Rhineland Palatinate with slight losses and in Baden Württemberg with slight gains in comparison with the last elections. There were, however, positive experiences in the state elections in Baden Württemberg: in Freiburg, Stuttgart and other cities there were gains of 2 to 4 percentage points and in some cases the vote was doubled. Where the party is solidly anchored and the election campaign reached out in the areas that were flashpoints, they were able to improve their results. However, the high level of approval for Kretschmann and Dreyer made things difficult for Die Linke. In Rhineland Palatinate in several urban constituencies Die Linke got almost twice as many votes for their constituency candidates as for the party list – a sign that potential left wing voters were voting tactically to prevent Merkel being toppled from the right. In Saxony Anhalt the vote for Die Linke plummeted by 7.4 percentage points to 16.3 percent. In a situation where the party leadership was oriented on forming a coalition government with the SPD and the Greens and with an election campaign that emphasised allegiance to the state, Die Linke lost 28,000 votes to the AfD. The latter went into the election campaign with a clear profile as an opposition party and was able to gain the support of protest voters. An editorial in the Süddeutsche Zeitung commented on this: “The AfD is the current addressee when it’s a question of formulating protest; thus it is adopting a role that otherwise had always been assigned to Die Linke.” The AfD was able to gain support not only with its rabble-rousing against refugees; its posturing as a protest party against “that lot up there” allowed it to gain voters who traditionally voted for Die Linke but felt that the party is now part of the political establishment. Particularly alarming is the fact that the AfD also succeeded in achieving high double-digit results in large cities and urban areas, especially in poorer districts. Thus in the Mannheim I constituency, a classic SPD stronghold, it became the strongest political force with 23 percent. This penetration into the urban working class is a new dimension in the history of the radical right in Germany since the Second World War. When, for example, the Republikaner party entered the state parliament in Baden Württemberg with double-digit results in the early 1990s, their successes were almost exclusively in rural areas. The fact that the AfD was also able to penetrate into classic working class districts shows that it isn’t just in the conservative milieu that racism against refugees is continuing to expand. The AfD has succeeded in doing something that Die Linke hasn’t managed: it has presented itself as the opposition force against the established parties, as an anti-system and protest party. It was able to gain hundreds of thousands of new voters among former non-voters. Admittedly, at least in Baden Württemberg, Die Linke also acted as a clear opposition party with a sharp anti-racist, social and combative profile. But it was unable to create a dynamic comparable to the racist and anti-social opposition of the AfD. Currently the radical right has a considerable ability to mobilise in society, and not just in elections, as was shown on 12 March in Berlin by the march of over 3,000 Nazis and racists from the milieu around “Pro Deutschland” (Pro Germany), the NPD (a more or less open Nazi party) and Bärgida (the Berlin version of Pegida). In this climate it is to be feared that violence against refugees and refugee accommodation will continue to rise. The party is presently in the middle of a process of fascisisation, that is, a transition from a right wing populist protest party to a neo-fascist combat party. The increasing mobilisations on the streets and the strict opposition course, which the neo-fascist wing of the AfD is encouraging, are an expression of this. While the party’s chairperson Frauke Petry speaks of participation in government in 2021, the fascists in the party don’t want to take over the government within the bourgeois democratic state; instead they want to fight against the political system as a whole, with the goal of ultimately smashing parliamentary democracy. The process of fascisisation will lead to new faction fights within the AfD; in these the spokespeople will be the party’s chairpersons Petry and Jörg Meuthen on one side and Gauland and Höcke on the other. At the moment the neo-fascist wing is pushing the right wing populist wing further. The state organisations of the party in the Eastern states Thuringia, Brandenburg and Saxony Anhalt are firmly in the hands of the neo-fascists. The advance of this wing is based on the radicalisation of wide layers of voters through the continuing mass demonstrations in many large and medium-sized cities and towns. This was shown in the local election results in towns in Hessen such as Büdingen and Wetzlar, where the AfD didn’t stand candidates but the NPD was able to achieve over 10 percent. In this situation it’s the task of Die Linke and all anti-racist and anti-fascist forces to obstruct the AfD with all available means and to stop it before it is able to anchor itself in the German political landscape. This will only be successful if Die Linke stays firm on the refugee question and offers solutions that are alternatives to closing the borders. It is disastrous when, for example, the chairperson of the Bundestag group of Die Linke, Sahra Wagenknecht, speaks of the threat of Germany being overburdened by the arrival of more refugees. By warning of “limits to capacity and limits to the readiness of the population” to accept refugees, she is positioning herself rhetorically to the right of Merkel. Die Linke must take seriously the fears in the population, which have been fuelled by the racists from Seehofer to Höcke. But under no circumstances should the party give the impression that there is even the minutest element of truth in the racist rabble-rousing against refugees. Nowhere in Europe, and also nowhere in Germany, have people lost their homes, their jobs or their incomes because of the refugees. Nowhere in rich Europe, certainly not in extremely rich Germany, have the limits of the ability to absorb refugees been reached or even tested. However, nowhere in Germany is the surplus of accommodation and food that really exists fairly distributed. Nobody has taken the keys to the millions of empty offices and second and third homes away from the rich and the super-rich; they are still standing empty. Instead the refugees are being accommodated in gymnasiums and more and more people are being pushed out of their homes in the urban centres, not by refugees but by wealthy middle class and rich people, who can afford high rents. As long as these immense riches go untapped, the ability to absorb the refugees will not be anywhere near exhausted. For this reason Die Linke should also refuse to speak of a real “refugee crisis”. The AfD is profiting from the fact that a mood of crisis has spread into large circles of the middle classes. Die Linke must oppose this with all its might instead of swimming with the current in the hope that it won’t go under. In addition, it must offer an alternative solution to the EU’s policy of closing the borders. The split in the European elites about where and how to stop the flow of refugees from the Middle East has strengthened the hand of those who want to have the refugees at the borders shot, a demand put by Frauke Petry, which she withdrew only after strong protests. The conflict between Merkel and Seehofer is simply the continuation of this debate on a national level. Following Austria’s lead the Balkan countries have closed the border to Greece and thousands of refugees are being prevented from travelling further. Instead the Merkel government wants to seal the sea border in the Mediterranean. In return for this she wants to support the Turkish government with 6 billion euros, to allow visa-free travel for Turkish citizens into the EU and to open up the path towards Turkey joining the EU. Sahra Wagenknecht has sharply criticised Merkel’s plan to stop the refugees at the outer border of Europe with the aid of the Erdogan government in Turkey, a government that is itself involved in a bloody war of repression against the Kurdish minorities in Turkey and more recently in Northern Syria. However, correct as it is, this criticism will lose credibility if we don’t at the same time demand open borders in order to save the refugees. On a popular TV programme Wagenknecht gave the impression that there was no difference in principle between Die Linke and the AfD, represented by Alexander Gauland. She didn’t object to Gauland’s demand to close the borders within Europe to refugees. Die Linke must reject the demand to close borders – whether the external or internal frontiers of the EU – and demand the opening of a safe land route from Turkey into Central Europe. It is not the refugees that need to be combated but the things that are causing them to be refugees. Among these is the immediate halt of all German participation in wars in Asia and Africa and of German armament exports all over the world. In order to finance the absorption of refugees, the rich, the banks and big business must be made to pay up. Die Linke should aggressively take up SPD leader Sigmar Gabriel’s push for a “new solidarity project” and demand a welfare package for the “general population”. His party was unable to benefit from Gabriel’s welfare demands shortly before the elections. Finance minister Schäuble dismissed them as “electioneering bluster” and evidently the mass of voters also saw them as being merely a manoeuvre. However, Die Linke won’t gain anything by joining Schäuble in only accusing Gabriel of deceiving the electorate, which he does. It must take up Gabriel’s demands and increase the pressure on him and the SPD to get serious now. But Die Linke must build up the power to reinforce these demands with real movements and struggles. During the election campaign Die Linke didn’t succeed in steering the misdirected fears and uncertainties towards the actual sources of danger: capitalism, its crisis and the social grievances and insecurities associated with them. Unlike the phantom fears being stirred up against refugees or Islam, these fears are real and justified. But social insecurity and fears of downward mobility don’t automatically lead to the right. The example of Greece shows that, where the working class puts up a fight with mass strikes and struggles from below, racism has little chance even when these struggles haven’t been successful yet. But a sharp social and anti-capitalist profile of Die Linke in election campaigns won’t be enough to stop the AfD and the dynamic of racist movements such as Pegida. At the moment the majority of Die Linke is still oriented towards parliamentary politics and neither capable nor willing to engage in class struggle from below. In Saxony Anhalt the leader of Die Linke posed as the respectable would-be prime minister of a “red-red-green” coalition with the SPD and the Green Party. Die Linke in the East has lost much of its appeal as a left wing protest party. As long as racism continues to advance, the right wingers will continue to misuse refugees and migrants as scapegoats for social problems and fears of falling living standards. A critique of neoliberal conditions and growing poverty will be even less adequate with regard to the neo-fascist wing of the AfD. This wing, in contrast to party chairpersons who still formally constitute the leadership, no longer poses as a neoliberal party. Its spokesperson Gauland had a performance of this kind in the state parliament of Brandenburg shortly before the elections. Following Gabriel (SPD), the spokesperson of the AfD parliamentary group demanded a social pact for Germans and opposed the suspension of the minimum wage for refugees “as is being demanded more and more frequently by business lobbyists”. Gauland emphasised that the social problems had been neglected for years and asked whether “a German in need of social support would first have to cross the Mediterranean in a dinghy” before any notice would be taken of him. His deputy Kalbitz demanded the increase of East German pensions to West German levels. The days of Bernd Lucke and Hans-Olaf Henkel (the neoliberal business-oriented founders of the AfD) are more and more a thing of the past. A critique of the AfD without a focus on its racist character will increasingly miss its target. That’s why it isn’t sufficient to criticise the AfD as a neoliberal party of the employers and the rich. Petry was against the minimum wage, whereas Höcke and Gauland vehemently defend it – “against refugees”. A left wing critique of the AfD must take this ambivalence into account. In particular, where it is already appearing with “national social” slogans, Die Linke must attack the racist, national-chauvinist character of the AfD, which will deepen the division in the working class and thus increase its powerlessness with respect to capital just as much as an openly neoliberal programme. The neo-fascist wing has committed itself to the struggle of the poor against the poorest. And that’s also something that only benefits the rich. No homeless German will get a home just because the refugees are sent back to the war zones. The central demand for Die Linke is: equal social and political rights for all – against division into Germans and migrants. It isn’t enough to fight the AfD on social issues. Only if Die Linke combines anti-racism and anti-capitalism will it be able to beat back the AfD. Anti-racism without anti-capitalism will not succeed, but this is also true for the opposite: anti-capitalism will not succeed as a purely social movement without a strong anti-racist movement. To stop the AfD a huge nationwide anti-racist mobilisation that goes far beyond Die Linke is necessary, a mobilisation that strips the party of its national-conservative camouflage. For that in turn broad unity in action of all serious anti-racist and anti-fascist forces is necessary. In this action Die Linke must sharpen its profile as an anti-capitalist protest and combat party and simultaneously be part of this nationwide mass movement against the AfD. Many people are still not convinced that the AfD is in the process of developing into a new mass fascist party. This won’t happen without splits, but the party won’t disappear of its own accord. At the moment underestimation of the danger is the main obstacle to building broad and resolute unity in action against the AfD. Even if the current situation is extremely dangerous and the mood is threatening to shift further to the right, after the shock triggered by the performance of the AfD in the state elections, the opportunity also exists to strengthen and expand the anti-fascist resistance. In recent weeks and months there have been many successful counter-mobilisations in numerous towns and communities. On 12 March in Geretsried in Upper Bavaria more than 1,000 people demonstrated against an AfD meeting which drew 150 people. In Breisach in Baden-Württemberg on the same day more than 1,000 demonstrators took to the streets against a rally with Petry. In Freiburg and many other towns it was almost impossible for the AfD to campaign on the streets because of counter-protests. The only AfD election rally in Freiburg with the top candidate Meuthen didn’t even take place because of the threat of a protest. In Baden Württemberg alone, more than 20,000 people have demonstrated against the racists of the AfD and the local offshoots of Pegida since January. There have been examples of large counter-mobilisations, disruptions and even successful prevention of AfD meetings and rallies in many places. In those places where they didn’t happen and the rabble-rousing remained unchallenged, the racists have been able to achieve hegemony on the streets and now also in the regional parliaments. In the south of Saxony Anhalt, Poggenburg’s AfD got up to 30 percent of the party list votes and won many constituency seats. If things have reached this stage, it will become significantly harder to oppose the right with an anti-racist offensive. That’s why now is the time to act and to oppose the rise of the AfD through a nationwide campaign. Since the beginning of the year efforts have been made to lay the basis for building a broad anti-racist movement against the AfD and growing racism. The first step is a central conference in Frankfurt-am-Main on 23-24 April. Starting from there it is intended to launch a mass campaign of activities and educational work to stop the racists and the Nazis before they are able to establish themselves firmly on a nationwide basis. Further information on the campaign and the appeal of the coalition for the action conference can be found at aufstehen-gegen-rassismus.de. This translation (by Einde O’Callaghan) first appeared on the Socialist Review website. The original German version is here.